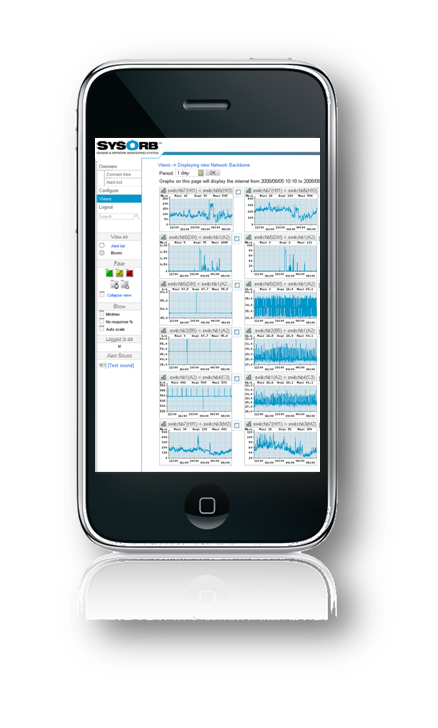 SysOrb is an advanced server and network monitoring system with many features and yet it has a simple and easy-to-use web interface which means short implementation time and significantly less training needed than with other competing network monitoring systems. SysOrb is Danish developed and was originally designed with Hosting and Managed Service Providers needs in mind, but today SysOrb is also used by many corporate IT-departments. The SysOrb architecture allows for monitoring of LANs as well as WANs with many different geographical locations. Supports Windows monitoring, Linux monitoring, UNIX monitoring and Novell NetWare monitoring. Alert notification via email, SMS or script. Has a rich variation of different graphs features giving you a unique overview. Is a stand-alone system that comes with all the critical features integrated – database, report generator, alert notification etc. No need for external databases and easy maintenance of the monitoring system. Monitor across vendors, apps, and device types meaning that no other monitoring systems are necessary use one tool only. Offers unparalleled performance and within seconds you can easily generate reports showing you the check results for e.g the last 3 month, 6 month or the last year. To get a quick introduction to SysOrb server and network monitoring tool you can view the SysOrb intro presentation. 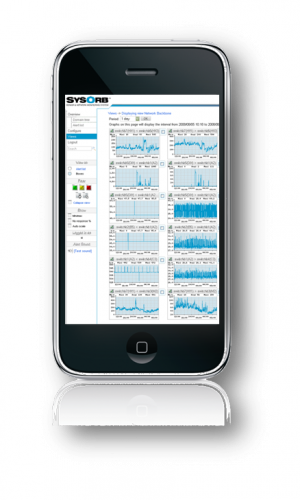 The SysOrb™ Server & Network Monitoring System consists of three main software products: SysOrb Server, SysOrb Satellite and SysOrb Agent. These products interact platform-independently from platforms like Windows, Sun Solaris, numerous Unix and Linux distributions, and Novell NetWare. SysOrb Server contains the main user/administrator console, database, web server for use with the Web User Interface, and the ability to perform passive (NetChecks) and SNMP-based (snmpChecks) monitoring of networked servers and devices (such as routers, switches, printers etc.). It is also the SysOrb Server that sends alerts to system administrators via SMS, e-mail or pager, when the monitored systems reach critical or alarming conditions. The SysOrb Server is required in order to make use of the other SysOrb products. SysOrb Agent is very light software tool that needs to be installed locally on the virtual/physical servers that need to be monitored actively. It collects data from its host on parameters like CPU usage, free disk space, free memory, process presence and much more, and communicates these data back to its SysOrb Server.If the built-in checks of the SysOrb Agent does not suffice for a particular server setup, it is posible to write extension scripts that the agent can use. SysOrb Satellite is basically a reduced-featured SysOrb Server. It can be used to monitor remote LAN's and is especially usefull if you want to do IP polling and SNMP monitoring in a remote LAN. The satellite can also be used for creating multiple ping checks (from varous locations) on a node. Below is an example view of a network where SysOrb is set up to do server monitoring and network monitoring such as routers, switches, printers etc. SysOrb Agents are installed on the servers marked with an ”A” in a grey box. All other devices are monitored by NetChecks and snmpChecks. Above the SysOrb Server are shown input/output options and methods, in terms of XML import/export of data, alert/warning notification methods, and report generator.There is no limit to the number of SysOrb users registered in SysOrb, and they all access SysOrb via the Web User Interface – from within the LAN or from outside the LAN. Utilizing the security features of SysOrb, it is also possible to securely monitor other, remote LANs via the Internet (not requiring VPN). All communication between the SysOrb Agents and the SysOrb Server is bilaterally authenticated by means of 128-bit keys, which are renewed every 12 hours. Furthermore, the transferred data itself is protected using military-grade, symmetric 128-bit encryption (AES/Rijndael). This enables you to monitor servers placed on the other end of e.g. the Internet without compromising the security of your networks. The SysOrb agents only report data out of the firewall using port 3241.This means that you only need to open port 3241 in the firewall for outgoing traffic. The SysOrb software architects have developed a dedicated object and time-series database structure that is embedded in the SysOrb Server product. All historical monitoring data gathered over time is also stored in the database for later retrieval, presentation and/or processing for e.g. reports and forecasting. All data can be imported and exported via XML. ​​If you want to test SysOrb now then please Download our free 30-day SysOrb trial version with full functionality for testing in your own environment. Also check out our demo login here Live Demo SysOrb the login only provides viewing rights but this can easily be changed. You can also watch our learning tutorials to see how easy it is to get started with SysOrb. 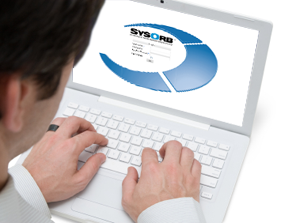 Login to SysOrb from your laptop or use SysOrb from your smartphone.